According to Dr. Mark Davis, Professor of Nutritional Physiology at the University of South Carolina, “Quercetin could be one of the most important discoveries in nutrition.” Found naturally in blueberries, onions, apples and red wine, this nutrient includes “powerful antioxidant and anti-inflammatory activity, as well as the ability to boost the immune system and increase mitochondria (the powerhouse of the cell) in muscle and brain is great news for those who often think that they’re too tired to exercise,” Davis said. In a study partially funded by the U.S. Department of Defence, Dr. Davis, the lead author of the study found that participants who took quercetin for seven days had a 13.2 percent increase in endurance. Participants were healthy and active, but none were athletes. So where do we find quercetin? 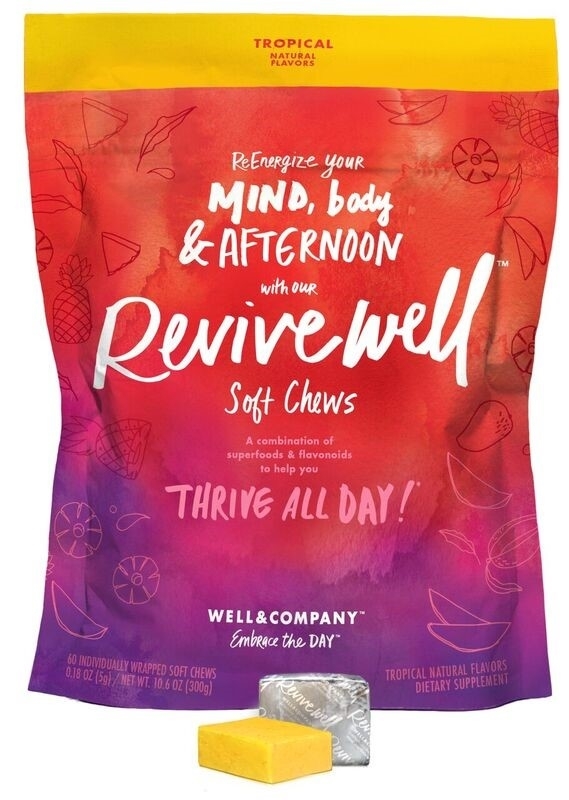 Revive Well and Wake Well, from Well and Company include patented formulas containing 99.5% pure quercetin. 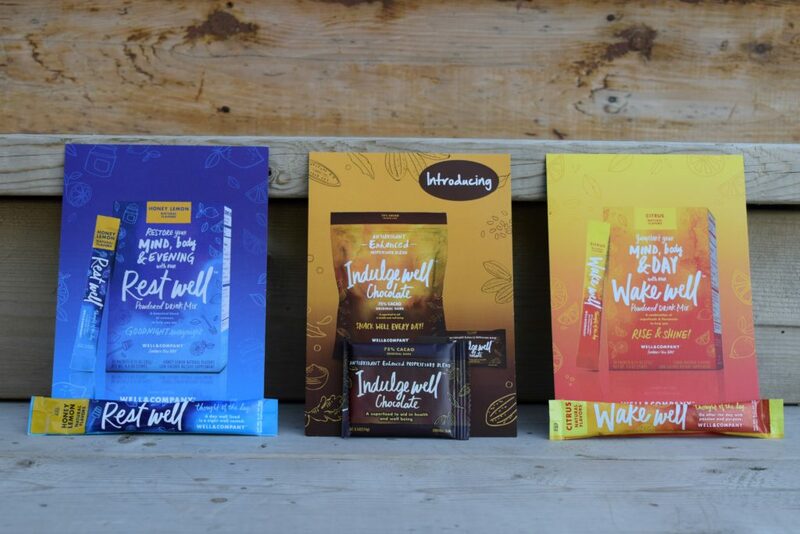 Wake Well is a powdered drink mix with a delicious citrus flavour that includes quercetin, green tea and B-vitamins. 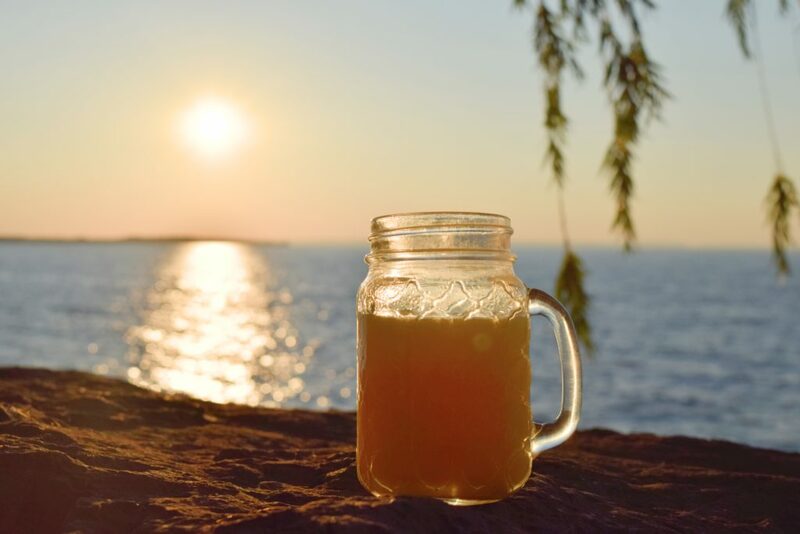 Sweetened with a combination of cane sugar and Stevia Leaf Extract, the formula is similar to a refreshing glass of lemonade, and packs a punch of flavonoids and anti-oxidants to kickstart your day. In trying out this formula for ourselves 75% of us found we had more energy that lasted longer into the day. A 7g package of Wake Well does contain 30mg of caffeine that comes from Green Tea and is less caffeine than the average cup of coffee. And with one exception, we are all coffeeholics. 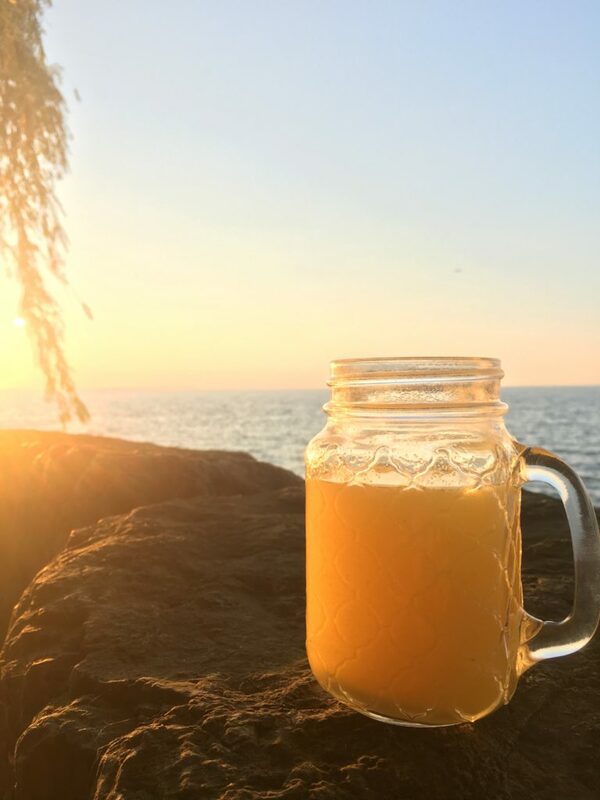 At only 25 calories the delicious drink is completely guilt free making this scientifically-based, patented formula a go-to morning drink with a lot less calories and more nutrition. Will I give up my morning coffee? Unlikely, but why not have Wake Well instead of that second cup. 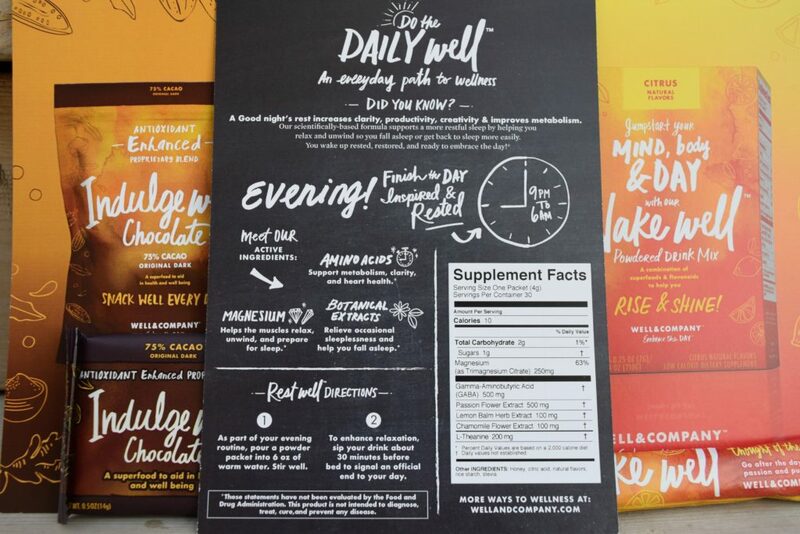 So we gave them chocolate, Well and Company’s Indulge Well Chocolate. These individually packaged 75% cocoa chocolate squares are as delicious as the pure chocolate your heart desires. 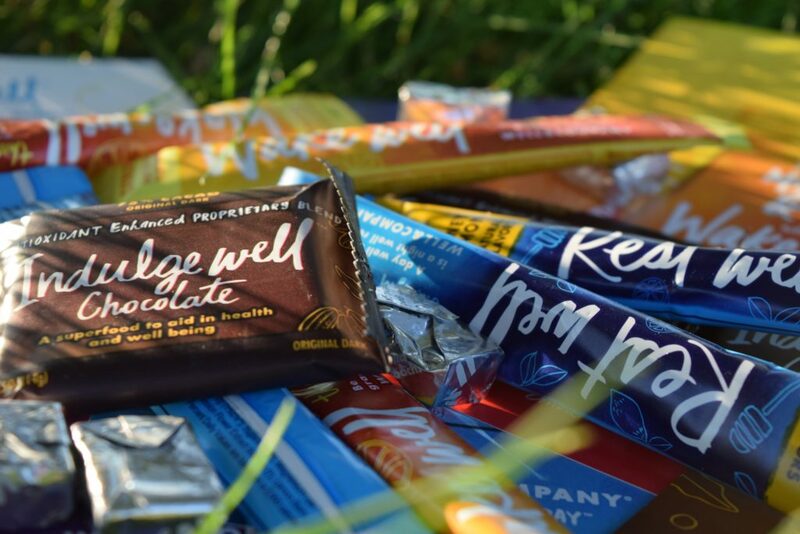 A proprietary blend of dark chocolate, flax seed oil, and turmeric provides anti-oxidant benefits while combating your cravings for something sweet, dark and delicious. At only 70 calories, non-GMO, Gluten Free, Vegan, and Dairy Free, these tempting squares are a guilt free indulgence that 100% percent of us absolutely loved. In fact when the sampling was over, some came back for more. Are you ready to embrace your day? 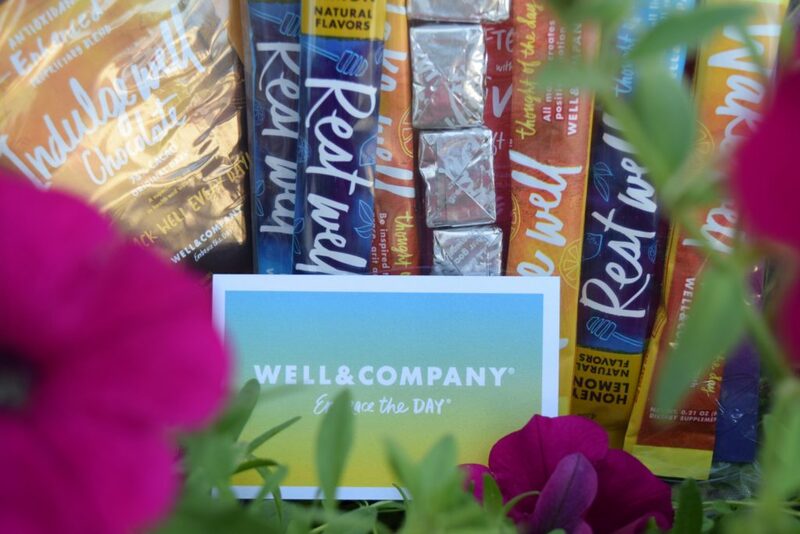 Through the generosity of Well and Company we are offering 3 lucky readers the opportunity to enjoy Wake Well, Rest Well and Indulge Well absolutely free. Comment below – How do you embrace your day? Share this post link on social media. (Yes, we do check before we qualify our winners.) You could use the buttons below. Giveaway contest is open to those with a USA shipping address. Giveaway contest begins at time of publication July 19, 2016 and ends Aug 2, 2016 11:50pm EST. Winner(s) will be randomly chosen and notified by email by August 12, 2016. Winner(s) must reply to notification email by August 19, 2016 11:50pm EST. Neither Well and Company nor TryBelle Magazine its partners or domiciles make any medical claims regarding the products mentioned. 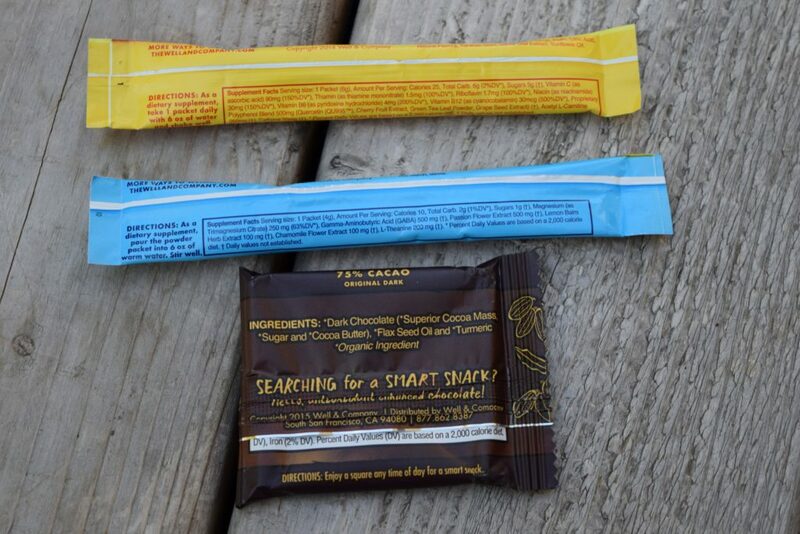 These statements have not been evaluated by the Food and Drug Administration or Health Canada. These products are not intended to diagnose, treat, cure or prevent any disease. 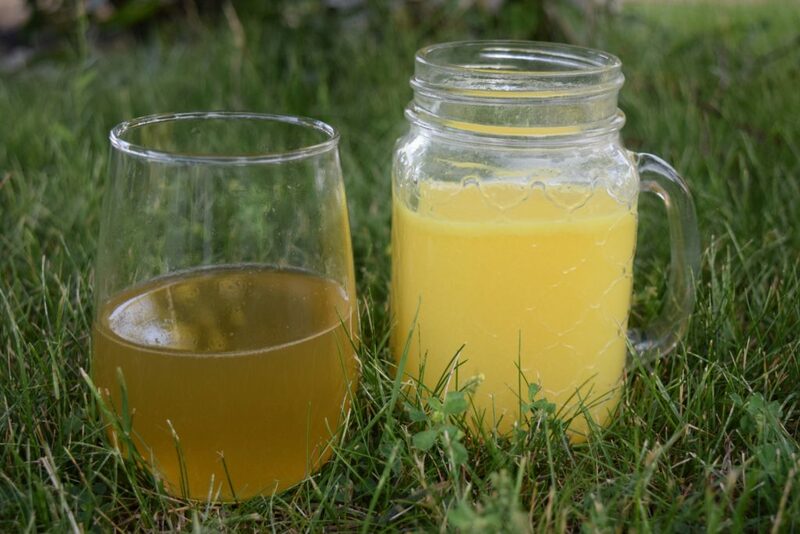 I embrace the day by having a drink of water and lemon, taking a brisk walk around my father’s 35 acre property and then eating some oat groats and taking my morning vitamins! Your product sounds like something I would live to try! I embrace the day by saying a prayer before I get out of bed. One that sets the tone for how I want the day to go and asking for guidance and protection. I embrace my day with two cups of coffee and relaxation before I head off to work. I embrace my day by thanking God for another day. I push myself to do yoga everyday. I have lupus so some days I just want to quit and cry in bed but instead I force myself to get up for 5 minutes, do some yoga and keep moving so i can keep moving ? I embrace my day by waking up early & making sure I put in 1 hour of exercise. I take a deep breath and a hot shower! I try to embrace each day when I think of loved ones who didn’t get another day to embrace. Life is short. I embrace each day by waking up early after a good night’s sleep, striving for balance in all aspects of my life, learning something new, staying organized, meditating (with the wonderful app Headspace, and going for a jog during the evening. I embrace the day by walking 10,000 steps daily! I embrace the day by doing my best. I embrace my day by squeezing in a workout every day! At least 25 min and a walk in the evening. I wake up early before the house wakes up and have me time to do anything I need or want to do! I embrace my day by making the best out of it. Ending my day with a relaxing bath, facial and manicure always makes me feel better. I embrace the day by taking a cool walk in the morning and greeting the day. I stay positive as much as possible. I embrace my day by doing as much as I can! Shared on twitter. OMG! Great giveaway 🙂 Thanks so much! Every morning I wake up and I embrace the day. I count my blessings, drink my green drink and I am ready for anything that may come my way! I thank my lucky stars for another beautiful day and I fully intend to use the next 24 hours to the best of my ability and use my heart as a compass. Embracing my day is the first step to acceptance of whatever my day will hold, sometimes it means I’m able to just get right up and get going, do some yoga stretches, take a shower, start to move with the rhythm of the day, take some quiet time to myself to set an intention I can keep coming back to. Other days when it’s harder I have to remind myself that my dreams won’t come true if I sleep through them. Walks are important too and part of my morning ritual, at some point a walk happens to get the blood flowing and my brain functioning. – And I’m super intrigued by these products and find that it’s the afternoon I struggle with the most and then I just have to get up and move, stretch, walk, do some stairs to get things going again. I embrace my day by making sure to sit snd have a cup of coffee with my sweetie before we both go on to our separate, busy days!? I embrace the day by making sure I get out in nature somehow, every day. Usually that means taking a walk in the evenings which helps me sleep better, but it also can be taking my daughters to the park and getting some fresh air. I embrace my day by staying positive even when something gets me down. I embrace the day by taking at least 5 minutes to do something nice for myself. I embrace my day by saying today is going to be a good day. I embrace my day by living in the moment, and not in my head. I take time to myself before I get ready each day to just think about what I want to accomplish. I embrace my day with coffee and yoga. I embrace the day by seeing each morning as a new start. I look at what needs to be done and try my hardest to achieve as much as I can. I also make sure I smile at every opportunity – it’s free and it makes other people smile when you smile too. I embrace the day by taking every day as unique and exciting, whatever life has in store for me for that day, and I try to allocate at least 15 minutes for meditation/yoga to enjoy the benefits. And lots of herbal tea! I enter contests every morning when I wake up. I embrace my day by drinking a full glass of water the moment I wake up to rehydrate and then I like to do squats and wall sits while I brush my teeth and get dressed. I embrace the new day by waking up and being thankful for everything that I have. My healthy family, a roof over my head, a car and a full time job! I like on Facebook under the name Jennifer Carroll. I embrace the day by going to the gym daily.Sometimes I help out a neighbor. I embrace my day by starting with a positive attitude and tell myself that I will be helpful and pleasant all day long. I embrace the day through prayer to our Lord and Lady. Thanks and God bless! I embrace the day through reflection, asking myself if today was worth a day in my life. I embrace each day by having goals and staying positive. I embrace my day with water aerobics most mornings, there is nothing better than being in the water it’s a great way to start the day. I embrace each day by being friendly with everyone I meet and try to do my best at everything I do. How do I embrace my day? Wow, sometimes I have a sugar free soy latte. I like TryBelle Magazine’s on Face book. I embrace my day with a prayer followed by exercise. I follow on Facebook as Pamela Halligan. I just give it my all.